"Performance happens when what you are doing matters. make what you are doing the only thing that matters." My quote above is about presence. And it's a theoretical statement! An ideal. In performance, when one is fully present and completely focused on whatever each performance moment needs, they can perform at their best ability level. Choosing to make what you are doing be the only thing that matters takes a ton of practice. That's why meditation is called your "Practice". When you can get present, you know what to do, and when to do it. There's also a bonus result that your focus ends up NOT being on what we might get if we perform well (a thought always followed by "Oh crap, what if I don't perform well!?) or who is in the audience, or wondering, "How does the audience think I'm doing right now?! Am I impressing them?" In performance, when you make what you are doing the only thing that matters, you can be present. When you are present, you are fearless. Ok, I think that covers the performance stage of Fearless Performance. There are three phases that we repeat over and over. 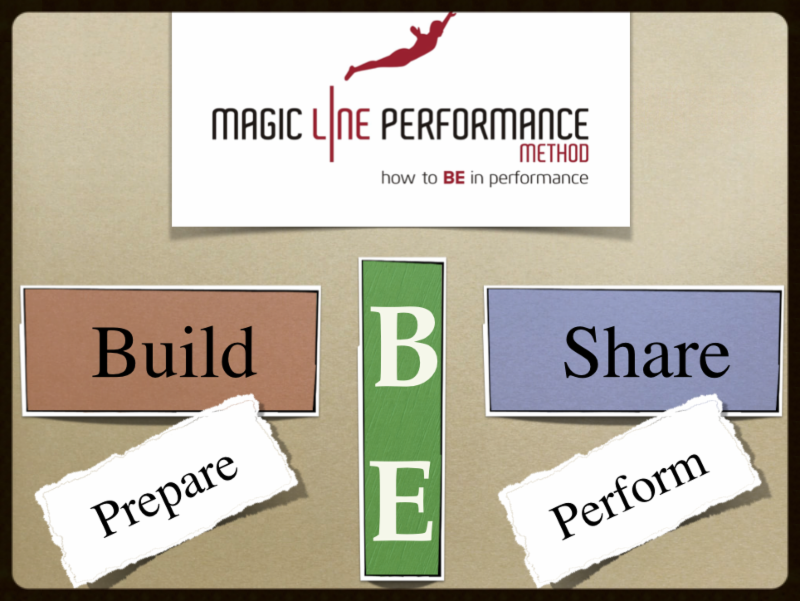 The best word I can think of to call performance is Sharing. There is also a rather large section of our day where we are preparing to perform. This preparation stage I call the Build phase. Then in the middle, when we can't Build any more but we're not quite Sharing yet, we BE. This is when we're what I call, "On Deck". It's when we're standing back stage, waiting for our meeting to start, or getting ready to climb the diving board ladder. Much more on all this structure in subsequent newsletters, and at workshops, etc. Though Fearless Performance is our goal, this does not mean that fear is completely bad. I often say that I don't do anything without a goal. After long concert weeks, if I have some time without a concert, I don't practice very much. But at some point, the next concert is drawing near, so I begin to practice. I just magically feel compelled to pick up my horn and make some time to practice. ...and more and more time is spent on the horn with each day running up to the next concerts. Why do I need urgency to practice? I love the horn and music, so it should just happen. Well, I also love my family, my students, writing my Fearless Performance book, watching House of Cards, and much more. It's because I need a goal in order to do the work. Yes, altruistically I should practice for the joy of practicing and improvement. But my wife and son are amazing, and at 45 years old now, I don't want to miss hanging with them! Hmmmm...playing Teenage Mutant Ninja Turtles with my son Rhys or playing scales on my horn. Sorry, I'm a Ninja today! So to stay balanced, and oh yeah, to stay hirable, I need some fear of not doing, getting, and/or contributing what I want professionally in order to do my work. Am I saying that fear can motivate quantity and inspire quality of your work?! NO! Absolutely not. Well...no. Maybe? Hmmmm...ok, yes. Fear in the preparation phase can be a good thing! That fear of the upcoming concert, or meeting, or audition, or race, or test, or date, can inspire you to get off of the couch and go better yourself in some way. As I said, I don't do anything without a goal. Call me lazy! But that's just the system that has worked for me. I set goals, and I go for them. Often my fears help guide me and tell me when my break is over, and when to take a break, and more. Fear helps balance my work. Watch how you think about your upcoming performances. When you think of them, look at your feelings. Use your fears to point you to where your work lies. Fear can be a great gauge of this. Leverage those fears to be balanced. There's no magic formula though. For auditions I won, for example, I'd tell my friends not to invite me to the movies, but they could ask me to play an excerpt for them anytime! I'd make my life about the audition for 3 months, do the audition, and then for the week after the audition I'd watch a dozen movies. Balance. Fear is a part of that balance. Remember you are the master of your mental game. PLAY it well...find your balance.